Update: dploy.io was relaunched as DeployBot. About a year ago Chris had a thought: what if we shared our deployment tools with more than just Beanstalk customers. Deployments have quickly become the most used feature in Beanstalk. They are so much a part of the whole development process that almost all new customers set up deployments. At the same time, our own customers were asking us if it was possible to deploy their other projects, the ones outside of Beanstalk. So that’s exactly what we did. We took our deployment engine from Beanstalk and created dploy.io. An extremely flexible and fast way to ship your code. Anyone with a project at GitHub, Bitbucket or even self-hosted can use dploy.io to ship their apps or sites to their customers. We integrate directly with a bunch of hosting providers: Heroku, Amazon Web Services, DreamObjects and Rackspace Cloud Files and Cloud Sites. You can also use FTP, SFTP or shell deployments for any web host in the world. 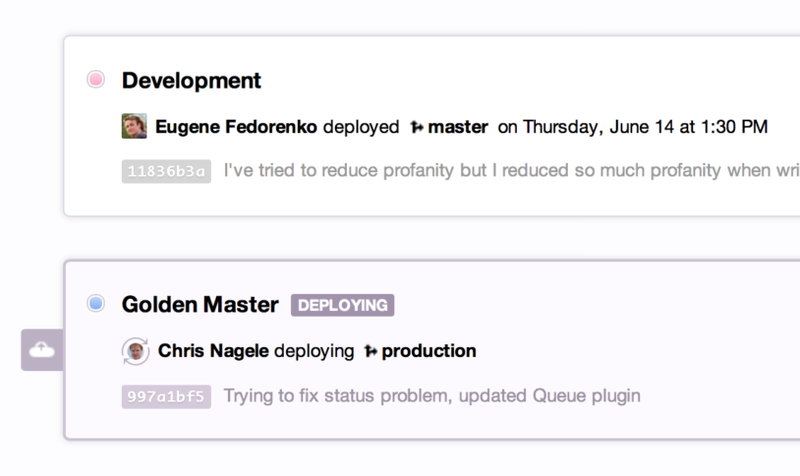 With shell deployments you could even run your Capistrano deployments through dploy.io, keeping track of past deployments and notifying your team. Most development teams have some sort of deployment process. The problem is that sometimes the entire team does not have access or the process is not consistent. Dploy.io gives you and your team one place to quickly ship your changes, even from your phone! Instead of manually transferring files, you can let dploy.io do the work for you. We’ll give you a live transfer log to show you what we’re deploying. We’ll keep track of your pushes and if you want, we’ll automatically deploy to your staging or dev machines on each push. We’ll just check for the changes since the last deployment, so our deployments are lightening fast. 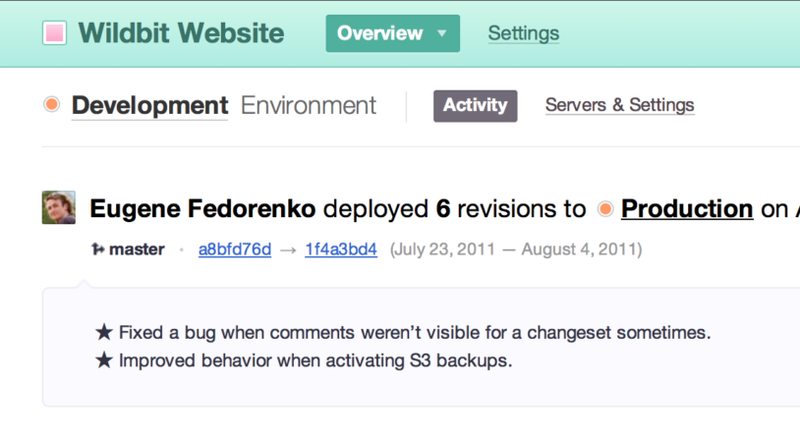 And, dploy.io will give you release notes you can share with your team. We’ll even email your team to let them know there was deployment. Is this a beta release? To be sure, this is not a beta release, and it’s not a minimally viable product. This is based on years of deployments and infrastructure at Beanstalk. We deploy over 150,000 times a week, and our average deployment times are 10-12 seconds. 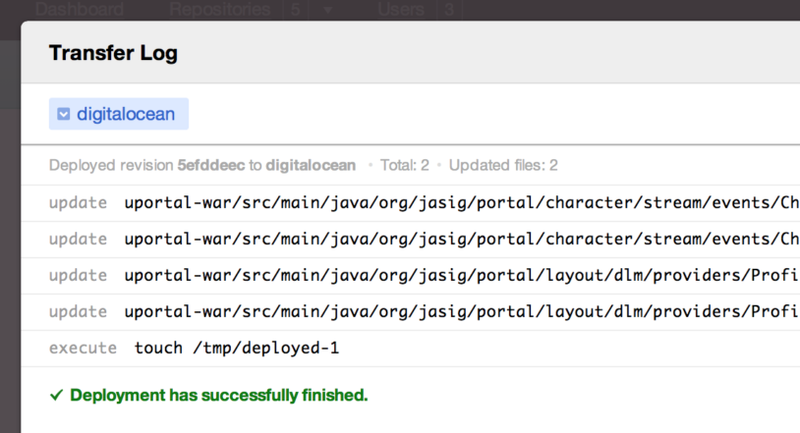 We even ship Beanstalk and dploy.io with our own deployment tools. Dploy.io is ready for your production releases. When we were coming up with pricing for dploy.io, we all simultaneously agreed that we should make it free for use with open source projects. So if you want to deploy from a GitHub or Bitbucket repo that has no authentication, you can do it for free. Any servers that require authentication will be included in your paid account server limits. Why integrate with our own competitors? If you’re a Beanstalk customer, you already get all of this included. Dploy.io is just a part of Beanstalk, where you also get to store your source code, collaborate on it, and keep everything in one place. But we know some teams prefer a different code hosting provider. Whether it’s to keep their open source and private repos in one place, or just because their team is tied to a different host. In any case, we know that our tools are the best out there, so we wanted to let everyone use them. If you want everything in one place use Beanstalk, but if not, use dploy.io with your other host. We’ll continue adding integrations with other hosting providers. If you have any ideas or questions, email support. You can also follow us on Twitter at @dployio. For now, we’re going to go celebrate our third product! Congrats to the entire Wildbit team. This was a great launch.